Standing at 5 feet, 3 inches, it’s easy to overlook the average Gurkha, let alone see him as a soldier. However, that mistaken belief may very well be your last thought if ever you meet this troop in battle: Their motto, “better to die than be a coward,” suggests as much. 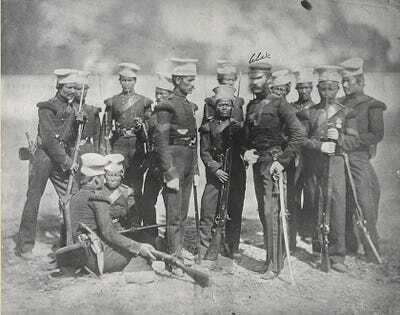 Wikimedia CommonsThe Nusseree Battalion, later known as the 1st Gurkha Rifles, in 1857. According to the peace treaty’s terms, the Gurkha’s were allowed to join the East India Company’s Army. Since then, more than 200,000 Gurkhas fought in virtually every military campaign — the World Wars, Afghanistan, and even the brief 1982 Falklands War. However, the UK wasn’t the only country privy to the Gurkha’s services; Singapore, Malaysia, and India have all employed them for their own armies and police force. Their bravery is illustrated in the case of rifleman Lachhiman Gurung. In 1945, Gurung was in a trench with two other soldiers when 200 Japanese fighters opened fire on them. After his comrades were wounded, Gurung noticed several incoming grenades fall into his position. He proceeded to throw them back, however, after the first two, the third grenade exploded in his right hand. Suffering massive injuries, Gurung managed to use his left hand to fire his rifle to kill several Japanese soldiers as they were storming his trench. All in all, 31 Japanese soldiers were killed during the fight. The Gurkha’s eagerness for battle comes at a cost, however — 43,000 of them have died during WWI and WWII. Although they have suffered heavy losses, their heroic actions haven’t gone unnoticed. 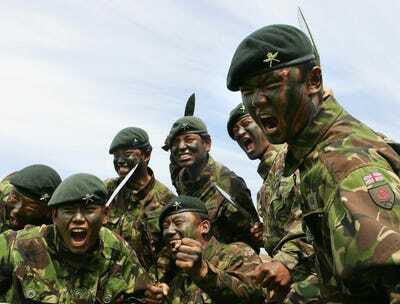 So far, 26 Victoria Crosses, the UK’s highest award for bravery, have been awarded to Gurkha Regiments. Nearly 28,000 Gurkha candidates compete for just 200 places in the British Army each year. In order to qualify, they are required to do 75 bench jumps in one minute and 70 sit-ups in two minutes. Afterwards, their next task seems like a scene from a kung-fu training montage — running 5km up the foothills of the Himalayas with 25kg worth of rocks on their back, in under 55 minutes. 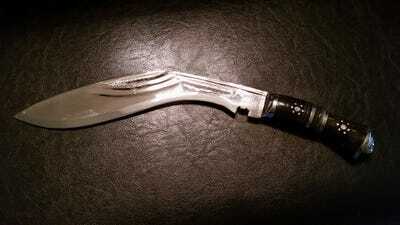 Each Gurkha soldier is eventually awarded a traditional weapon known as a ‘kukri’. Once drawn, this 18-inch curved knife is said to need to have tasted blood, in that if the Gurkha had not managed to draw the blood of his enemy, he would have to cut himself before sheathing the weapon. Although this may sound like ancient lore, evidence of this custom was provided by a Gurkha soldier fighting in Afghanistan in 2011 — In order to provide DNA evidence of the death of a highly sought-after Taliban commander, the Gurkha proceeded to behead the insurgent and carried the body part back to his base in a bag. As technology advances and weapons can even become operated autonomously, it’s not certain what role these soldiers would play in the years to come. Their numbers in the British Army have already dwindled due to budget cuts — going from 13,000 in 1994, to 3,000 now. 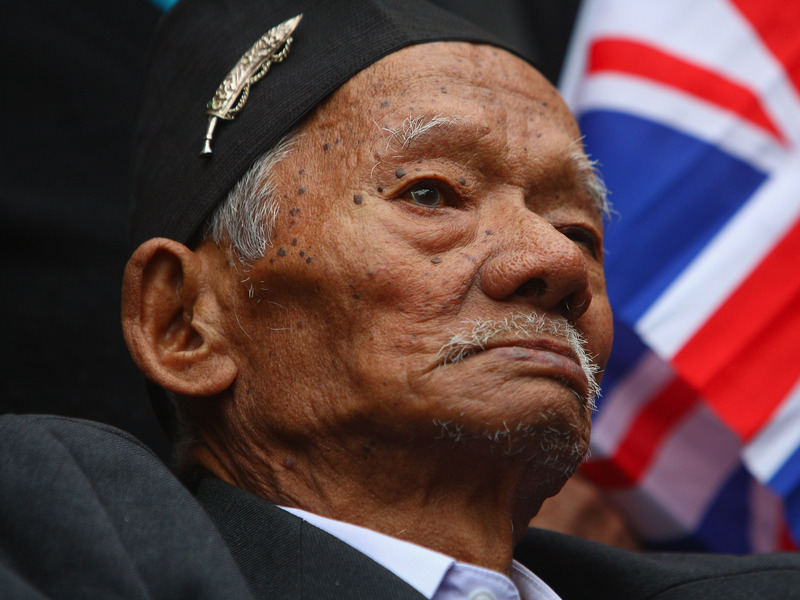 Further, controversy surrounding their treatment from the UK arose when it was discovered that Gurkha soldiers were receiving a pension of £37 a month, whereas British soldiers were receiving £800 a month — less than 5% to their counterparts. Due to the fact that Nepal is not a member of the Commonwealth, the Gurkhas are not considered British subjects, and as such, subject to this disparity. UK officials have also claimed that allowing all 36,000 former Gurkhas into the UK would create a massive pressure for immigration and social services. Although budget cuts and disparate treatment may affect the future of these soldiers, their deeds have already been etched in the pages of history as one of the world’s most fiercest fighters.